Made in the Timothy’s tradition, this flavor is both relaxing and invigorating. Sure to warm you up from being in the cold outdoors, if you live where it gets COLD in the winter. Dessert flavors of Caramel, Vanilla, and Custard accent this smooth coffee. 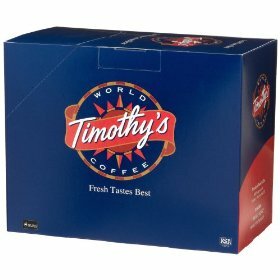 Timothy’s winter season flavor is sure to warm you after any outdoors activity. Relax with this all day dessert treat. Single-serving K-Cups means no mess or wasted pots of coffee; for use with Keurig coffee makers.